Ayumi is 3 columns and grid based layout wordpress theme. This theme has been featured on Smashing Magazine. 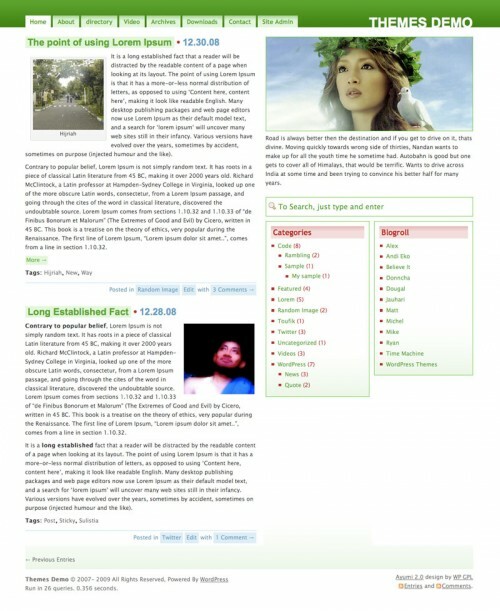 Ayumi Theme originally hosted on JAUHARI.net. But after theme licensed has been changed to GPL, The Developer decide to move Ayumi Theme info and updated on this website. We hove after decided to move to GPL licensed information website. This theme will be more usable and better support. I have no idea how to do a screen shot? Besides in this comment section pix don’t seem to paste. I went in to appearance — header and uploaded the photo. The first time I was asked for a caption ( I believe) I put it in then I changed the picture. I have cleared the image and returned to the default. Then reloaded nothing clears the words directly under the image. Sorry I can’t be more clear. Not sure where that is or how I found it or why it is there? So I suppose I need to get rid of that the Avatar. i love the theme! i am having a problem with the header. i’ve changed the header but in the browser the original header remains. is there a way to change that? My favicon should be a pig. Why does your header image override it? How do I fix that? Also any way to remove the Admin tab in pages? If I change the theme, I am still interested in a solution so I can return to yours. thanks, i download it. i searching in mbahdewo and jauhari blog and finally found this theme here. LIKE THIS! i want to upload it to my blog but unfortunately my blog is not WordPress. isn’t there a blogger version of it??? As for this template, can I use it in the blogspot? Oh my goodness! An exceptional write-up dude. Thanks a whole lot, even so I’m experiencing problems with the RSS. Do not know why I’m struggling to register for it. Can there be any person obtaining identical RSS concern? Anyone who knows kindly respond.